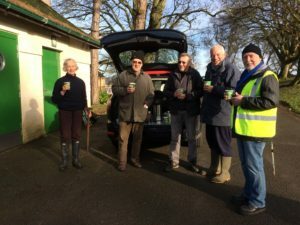 On the first Saturday of each month, a group of volunteers meets to do small maintenance jobs in the park – picking up litter, tending the wild flower beds, basic pruning, etc. It all helps to keep the park spruce and beautiful. It’s a sociable group, and we all share fresh coffee and biscuits at the end. Why not join us? We meet at 9.30 near the toilet block. Litter picking equipment is provided, but bring gardening gloves if you have them. Forthcoming action days are: March 2nd, April 6th (Wild Flower Seeding Day), May 4th, June 1st, July 6th.